I think I’m starting to get the hang of this Japanese thing. I made this great soup last week which the taller half said tasted a lot like udon. I have some pre-made dashi stock in the freezer which really helps to have as a time saver. 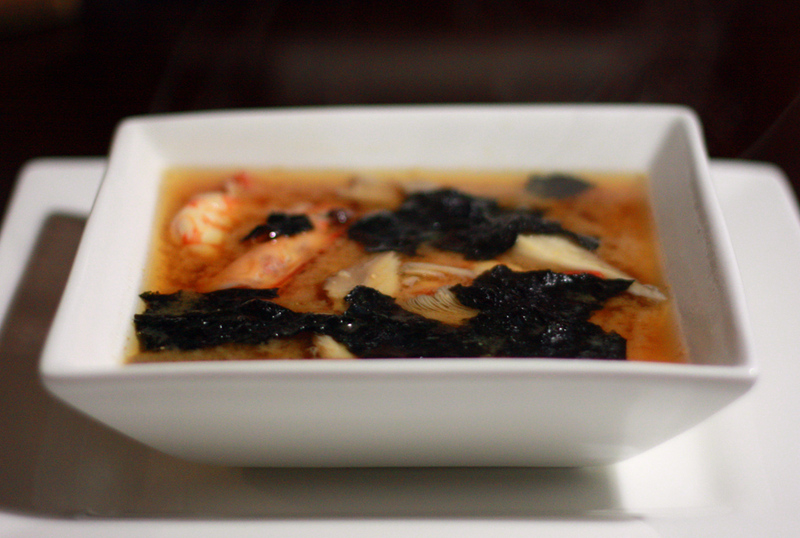 Also… don’t be scared to put all your prawn heads into this soup. You can fish them out for serving if you think they will freak people out but they really do give the soup an amazing depth of flavour. Bring water and dashi stock to a simmer dissolving the miso as you go. Add in prawns, prawn heads and mushrooms and simmer until the prawns and mushrooms are ready to eat. Remove prawn heads and serve in bowls sprinkling seaweed in as you serve. So long as you have the dashi stock on hand this recipe takes no time at all and is full of flavour.